In the mood for trolling around the island? Head out to collect some sand-dollars with your youngsters and have a wonderful time while doing it! Last weekend, I headed out in a car laden with children, snacks, game boys (to keep them occupied and the noise level down), and an atmosphere of curiosity, which was exciting as we ventured to the Northern part of Okinawa. When we reached Ginoza, we weaved through several streets and alleys, which housed an older population of Okinawans. The streets were lined with signs depicting an older man and woman walking as a means of caution for the drivers. The homes were older with more tiled roofs and open terraces. Old people emerged from their homes to stare at us as we passed by. Their gentle smiles greeted us as we strolled down to the beach area to find these treasured sand dollars. 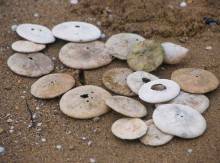 My children had never seen a sand dollar, so they were anxious to find this sand money lying all around. Soon after scooping out the beach we headed left, which was a mistake. Most of the sand dollars lay to the right with a large variety of medium-sized shells lying about. 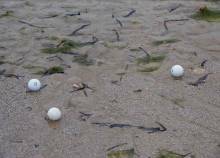 At one point I thought it was a "golf ball" beach since there were as many golf balls there as sand dollars. Once we spotted the first one, we found many lying about. Some were broken and some were whole, and most were colored a tannish-brown from the surf that surrounded them. There were several drainage ditches which poured water and a distinct odor into the beach which made you wonder of the contents, so be careful not to play in those areas for long. (Perhaps that is why the shells at this particular beach seem to be so large). We spend over two hours running and gathering the fake money into buckets and plastic bags that were obtained when we purchased ice cream from the local store a block away. Then when the voyage was completed, we headed up the road toward Camp Schwab for pizza and cokes. All were thrilled to bring home their treasures and never complained that the day was boring! When you get home, soak these treasures in pure bleach for a few days to get the whiteness back. Paint and decorate or just keep them as they are a rare find that you would never encounter on the beaches of New York or California. To get to Sand-Dollar beach, take the Expressway or 329 to the Ginoza exit headed toward Camp Schwab. Take a right turn at Route 13 (it kind of "Ys" at 13) before you get to Schwab. Cross a small stream and a little bridge. Then count six alleys on the right as you pass slowly through the small village. Park at the sixth alley and get out. The beach is on the right about one block down the narrow alley. Enjoy the walk through the small village, as you will pass through the ages in a short period of time.